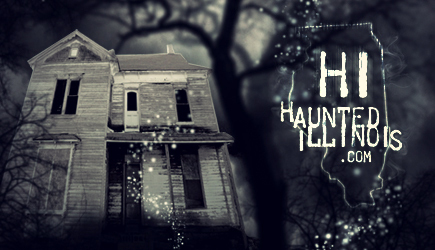 Visibility/Location: There is a sign on the main road through Auburn that says Haunted House. The sign is not lighted but the road at the sign does take you to the town square. On the north side of the town square the streets are barricaded and the haunted house is located just off the square on 5th street. If you try to turn onto 5th street using GPS the road is barricaded since there are two haunted houses on that street. There is plenty of free parking on streets around the haunted house and on the town square. Wait Entertainment: I did not see any costumed staff roaming and working the crowd. As we were getting ready to leave Auburn I noticed that there was a hearse with a pneumatic prop coffin in the back that opened to reveal corpse in black light, which was very cool to watch. Tickets are sold by groups and up to 5 people at a time. After purchasing your tickets you wait for your number to be called. At that time you can enjoy the concession stand, a popcorn stand, and 2 bon fires. An announcer, dressed in street clothes, would call your group number for the queue line, and every now and then would pick up a real ax to intimidate patrons or the staff. They do limit the amount of tickets they sell each night so get there early. November 1st and 2nd, they are advertising an Extreme Event. A t-shirt and a haunt for people looking for something a little more interactive. Tickets are limited to this event. Crowd Control: Auburn Haunted House has crowd control down to an art form. Every now and then you can hear the other patrons in the house scream but you never run into any other groups. Patrons are spaced out and moved in the right intervals to keep the flow of the haunted house moving. There might be 3-4 groups in the haunted house at a time. I have been traveling to Auburn for the last 4 years and they always seem to reinvent their house each year. This year�s theme was �13 Feet Under�. This was Auburn Haunted House�s opening night and the staff seemed to be ready to give you what you paid for, to be scared. As you walked into the house you were greeted by a dead sheriff that explained the rules and a short story of what was behind the door. Right before we entered he told us he does not want us to get lost in there so he slapped a visitor�s pass to my chest and opened the door. The first room we walked into was a room that looked like many people standing with white sheets over them. A simple set but very effective. As the lights flickered on and off some appeared to move around the room. Finally a door opened and we were able to proceed to visit nasty bloody nurse looking for her next patient. I can best describe this room as an operating room gone wrong. A bloody operating table and surgical items topped off the room nicely. Then a trip through a dark maze with someone or something just waiting to torment you as you found your way through. A man and a woman were turned into life sized ventriloquist dummies by a sick deranged man, were just waiting to come to life as we entered the next room. The detail with the make-up was very well done, right down to the bolts that appeared to go through the hands to hold the ropes. We were handed a flashlight as we descended down the steps to the basement. This is an old building and pitch black, dimly lit walkways, and damp smell of the basement adds to the atmosphere. This is the first time that I have been in a haunted house where they handed you a flash light. We chose to only use the flashlight as needed, yes to get the full experience we chose the dark. More twist and turns down dark corridors awaited us. As we moved into one area there was just a dark wooden and chain linked fence area. As we moved around the chain link the lights flashed and we were trapped and I was touched by a deranged man behind me. Not expecting this at all it did catch me off guard quite a bit. I really don�t scare that easily. I heard one person in my group say, the brave one just jumped, we are in trouble. At one point we came to the end of a dark hallway, well it seemed like a hallway until the floor started to move and the walls enclosed in on us. The walls and floor moving was forced on us a couple of times and then the attack came from out of nowhere. It was very effective. This was a very dark area with just a little light that peeked in behind you. The next dark maze I will call �can you find her girl�. Traveling through the pitch black maze with a creepy girl running though it saying �can you see her� and every now and then she would pop out of nowhere with a hand held strobe light, very effective for blinding you and not letting your eyes adjust at all in the dark. More rooms await patrons as you continue on through the house. A fully detailed dentist office complete with a patient telling you they are not going to take her teeth. I kept hearing her say �I have 32, I have 32�, as we left the room. Just make sure to keep you tongue in your mouth! The house contained an asylum that had metal looking doors with rebar enforce windows on one side and a brick wall on the other side. As you walked down the hallways you were not sure what was going to come out of the doors at you and believe me there were many doors for the crazies to choose from. In the basement it was hard to see the details in some places because it was really dark; but we did not complain too much on this because it added to the house. The fear builds up when you really can�t see what is coming at you, where you are at, or what is in store for you. Moving through the haunted house the scares seemed to get more and more intense with each room. Sometimes you really did not know where the scares were going to come from. As I said before this was their opening night and the actors and staff all brought their A-game. Actors remained in character as you entered and left the rooms and sometimes followed you out of the rooms to make you feel uncomfortable enough that you wanted to keep moving forward. The actors pushed the limits with bumping into you and had an in your face attitude. I really think I only saw 3 masks in the house everything else is detailed make-up. This haunted house uses actors for a majority of the scares to the patrons. They have very limited pneumatic props in the house, mainly for use of some doors and a few jump outs. The website says that the haunted house is not recommended for children 9 and under. I might even rise the age a little older for the graphic nature of some of the scenes and intense scares. My only complaint would be at one point while waiting in line they tried to put two children with our group. The girls were too scared to go through at that time so they hung back to go with another group. Since they sell the tickets by groups they should stay with that method and ask patrons if they mind having others added to their groups. A group of 5 adults would have been too many people for certain places in the house. The small town of Auburn is off the beaten path south of Springfield but it is really worth the drive. Wait times can vary after ticket purchase from an hour to two hours depending on your group number. Auburn Haunted House is a must visit this Halloween Season; I can only imagine their scares will get more intense as each night goes on.